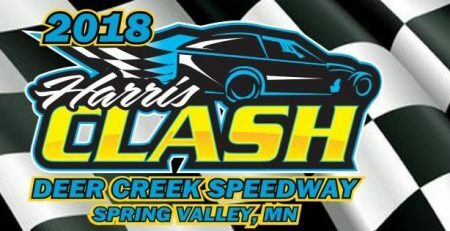 The Deer Creek Speedway in Spring Valley, MN has unveiled the schedule of events for the 2019 race season. This year will mark the 24th year for the speedway and will be the 18th under the direction of the Queensland family. The facility is well known for hosting big race events and 2019 will be no different. All of that to go along with the great weekly racing program that takes place every Saturday. There will be an open practice session held on Saturday, April 20 to give the drivers a shot to shake down their machines before the season kicks off. The first night of racing is scheduled for April 27 at 6:00 p.m. The line-up will be familiar to fans with USRA Modifieds, USRA B-Mods, WISSOTA Street Stocks, WISSOTA Super Stocks and WISSOTA Street Stocks featured on the program. There will be two more point night programs on May 4 & 11. On Saturday, May 18; NAPA Auto Parts will present the North Star Nationals. The Lucas Oil Late Model Series will bring some of the nation’s top Super Late Models to the high banks of the Creek for the second time. Then on Memorial Day weekend race fans will witness the nation’s top Modified drivers compete. 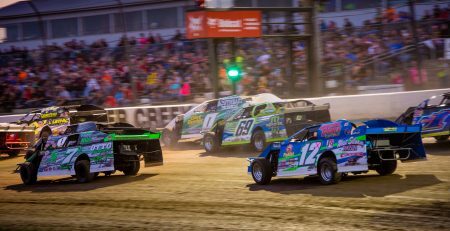 The United States Modified Touring Series (USMTS) will tackle the facility for the Southern Minnesota Spring Challenge. On May 25. June will roll in with two more point races on June 1 & 8. On June 15 it is the return of the school bus races and mascot night. The bus races always bring some crazy action every year. The annual “Pink-Out” event comes back on June 22 with Join-The-Journey to raise awareness and money in the fight against breast cancer. A huge fireworks display to celebrate our nation’s independence will take place after the races on June 29. On Saturday, July 6 the World Of Outlaws Super Late Models return for the 40th Annual Gopher 50. The event hits the big “4-0” this year and is “must-see” event amongst race fans in this area. Christmas in July will take place on July 13 and expect another huge crowd on July 20 when “Tasseldega Nights” returns. The night is to educate the fans on the corn growers and the ethanol industry presented by the corn growers of southeastern Minnesota. The perk for anyone that attends is admittance to the speedway is free that evening. The month ends on the 27th with the 4th Annual Driver Recognition Night. The afternoon and night is meant to recognize the drivers and pioneers from our sport’s history. There will also be several vintage race cars on display that day. All five classes will be in action that evening as well. August will feature the final nights for track points and the battles heat up for track championships with Saturday, August 3 the first of those. Then Tuesday, August 6 the speedway will again host the Harris Clash for IMCA Modifieds and Sport Mods. If you missed last year’s show, make sure you are in attendance this year as it will be yet another “must-see” show. Racing on August 10th will have the added spice of being AFCO Race of Champions Qualifier night for the WISSOTA sanctioned classes. Feature winners that night in the Super Stocks, Midwest Modifieds and Street Stocks will be qualified for the R.O.C. race held in Fergus Falls, MN in the month of September. Veteran’s night will return for the third straight year on August 17. Season Championship Night is August 24 and it is the final chance to accumulate track points and claim a track championship. The final Saturday in August on the 31st will have the second appearance of the USMTS Modifieds for the annual Labor Day Duel. On Saturday, September 14, it will be the inaugural Stock Car Nationals for USRA Stock Cars and USRA Hobby Stocks. It will be the first ever appearance for the USRA Hobby Stocks at the facility. The Stock Cars always put on a great show at “The Creek” and then add the Hobby Stocks and this is sure to be a barnburner that fans will not want to miss. 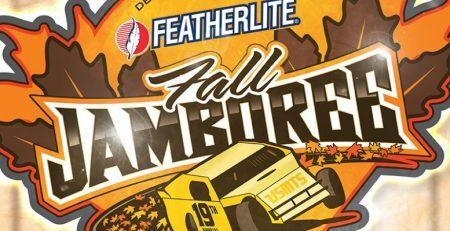 The season will conclude with the running of the 21st Annual Featherlite Fall Jamboree which is one of the most prestigious Modified events in the nation. The week kicks off on Wednesday, September 18 with an open practice session. Then the Modifieds do battle on Thursday and Friday with two, $5000 to win shows. On Saturday it is another complete program with a cool $10,000 on the line for the Modifieds. The USRA B-Mods will bring a big field of cars to race three complete shows in the three night modified extravaganza. 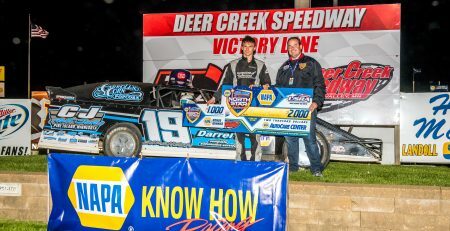 The Deer Creek Speedway is a high-banked 3/8-mile clay oval which sits on 60 acres just 15-miles south of Rochestrer, MN with one of America’s most popular state-of-the-art racing complexes and an adjoining campground. 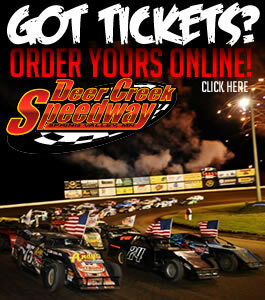 For more information on the schedule or tickets for upcoming events go online at www.deercreekspeedway.com or by calling the track office at 1-800-DCS-RACE. Make sure to like our Facebook page, follow the speedway on Twitter or check out the YouTube channel that features video action from the speedway.